Flood looking north on 6th St, Trinity Church on right. [contemporary note]: 109-Portland, misc. [sticker with logo]: Hill Military Academy Portland Oregon. [photographer's stamp]: J. W. Applegate. 537 Mitchell St., Albina. Description Scanned as B & W; overexposed in spots. There were major floods in 1890 and 1894. Red stamp on front lower border: 537 Mitchell St., Albina. 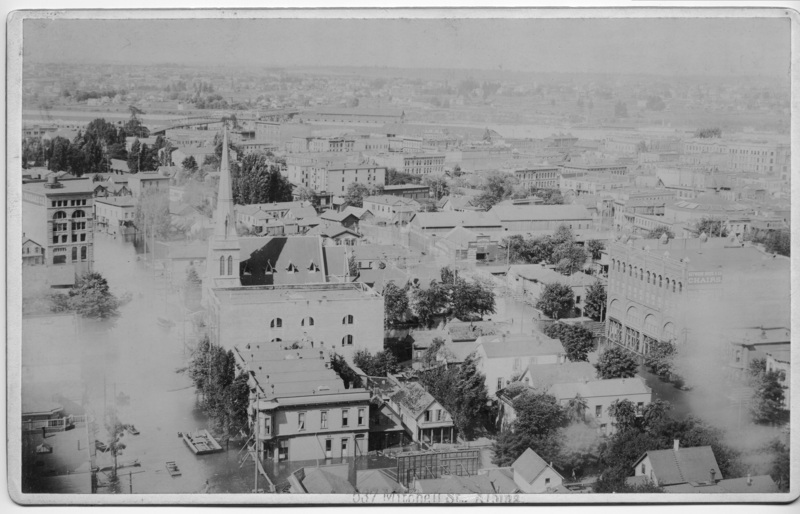 Transcription Flood looking north on 6th St, Trinity Church on right. [contemporary note]: 109-Portland, misc. [sticker with logo]: Hill Military Academy Portland Oregon. [photographer's stamp]: J. W. Applegate. 537 Mitchell St., Albina.